This week I’m planning my mother-in-law’s birthday party. Her big day is November 1, so the family is having a Halloween party on Saturday. 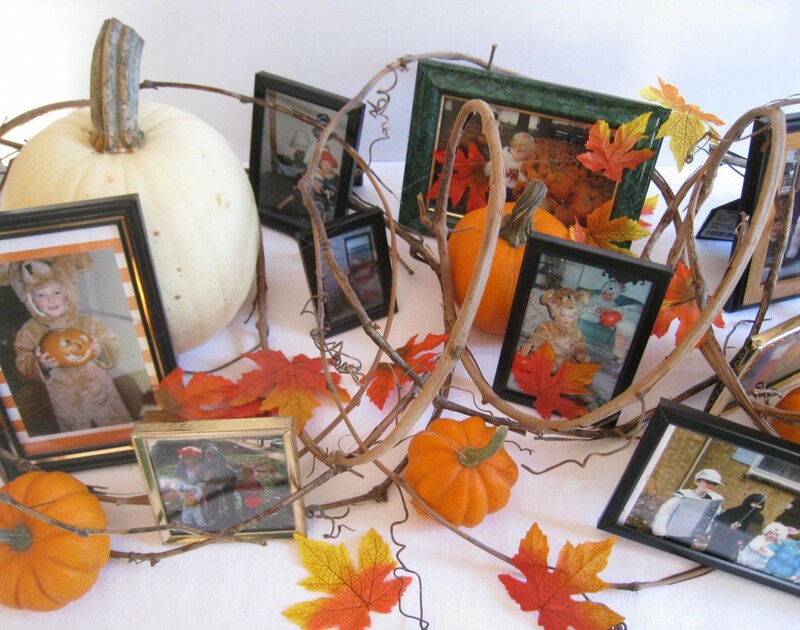 I’m still inspired and challenged with using picture frames for holiday decorating this season. We all have personal photos on display in our houses. Our kid’s school pictures, our wedding photos, candid shots of family parties and celebrations. 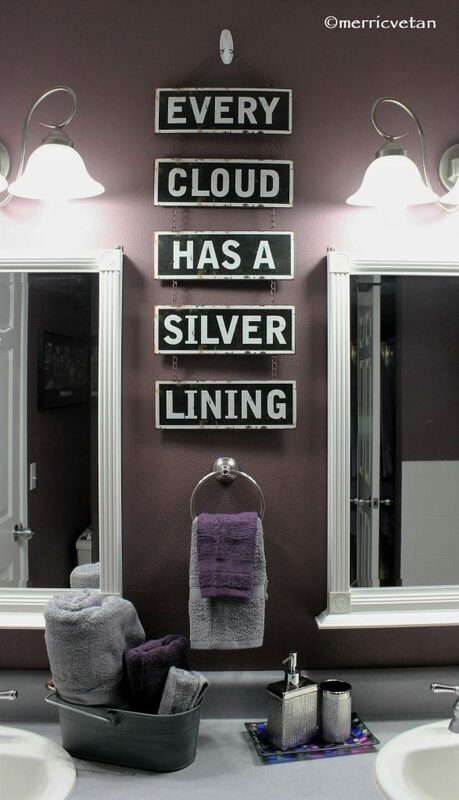 After all, creating a warm and welcoming home means including personal items in your interior decorating. Tip: Photos look better when grouped together instead of scattering them around the room. Quantity creates a much bigger impact. 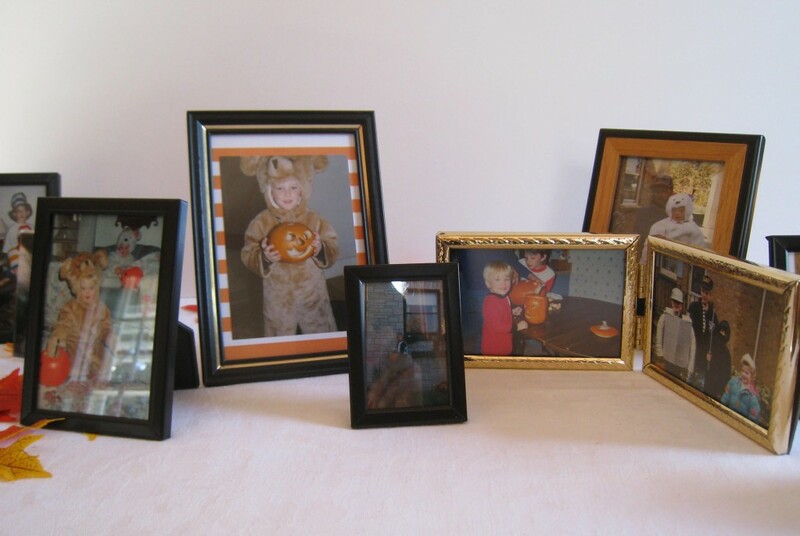 Choose a variety of sizes, finishes and orientations when selecting picture frames. Different heights and textures make a more interesting display. 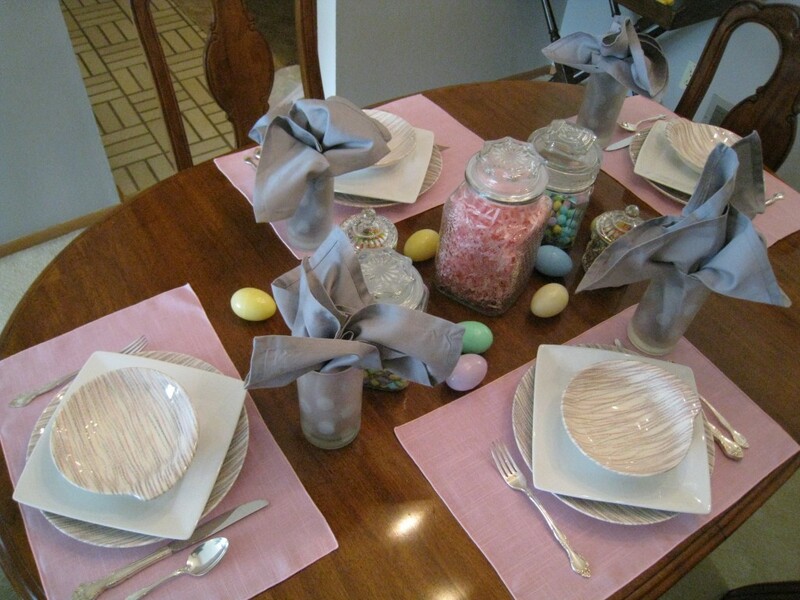 Last week I showed you what my table setting will look like (see “That Old Black Magic”) for ideas. Since the Packers didn’t play until Sunday night, I spent the afternoon looking through old photo albums for Halloween pictures of my sons and nieces and nephews dressed up for trick-or-treating. Then I gathered all the old frames I could find in my stash and shopped at Goodwill for other options. 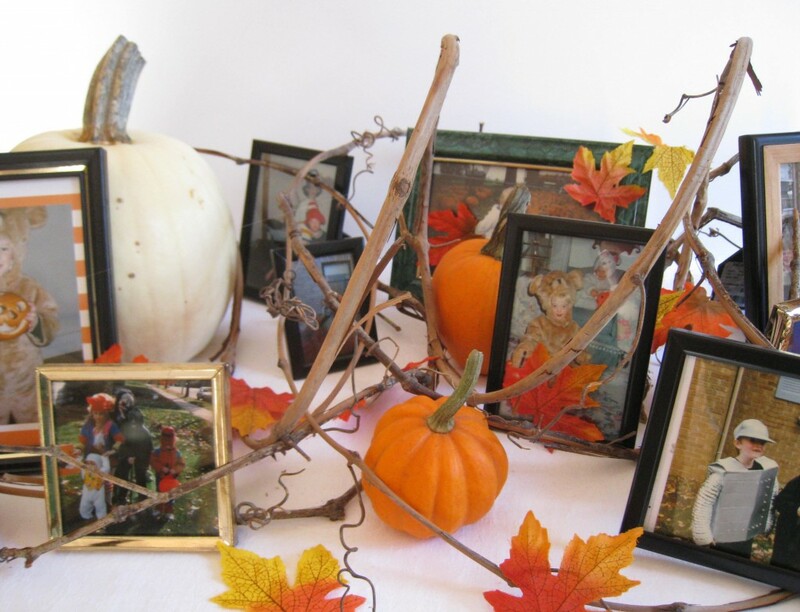 Saturday, I’ll arrange them down the center of the dining table (being careful to have photos facing both sides of the table) along with dried grapevine and an assortment of pumpkins and gourds. The kids are grownup, but I know they will all get a kick out of seeing their pictures and remembering the year they dressed as a robot or monster or teddy bear. It will be a fun walk down memory lane for the whole family! 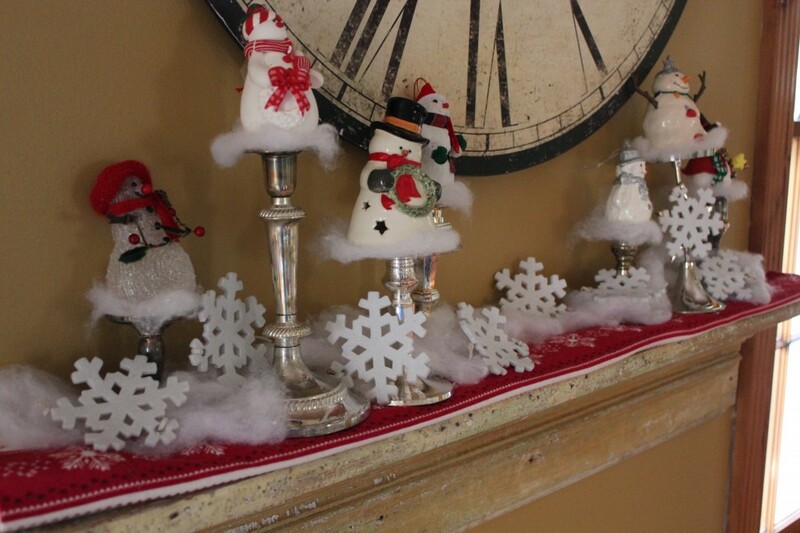 If you aren’t planning a party, the same idea is perfect for your mantle. Thanks for stopping by my blog. BYW was very fun but I feel I didn’t have time to go through and meet many people. I love your idea with the old Halloween photos. What fun!